One of my greatest loves in life is silent cimena, particularily German Expressionest silent cinema (great for me that I now live in Germnay!). So, here is a post I would like to share with you all written about one of my favourite films ever, The Cabinet of Dr. Caligari, or Das Kabinet des Dr Caligari. Enjoy and I would love to hear from any other silent cinema fanatics out there! Propaganda – the ability to transmit specific messages which have the aptitude to become engrained in the minds of a large audience and in turn manipulate their perception of a certain situation. Sounds like a complicated process, so how can one easily install this method into the mentality of others? The answer is quite simple really: through films. The propaganda film began its existence in the early 20th century, with many citing German expressionist film as the beginning of propaganda film, with a particular focus on political propaganda. Both these German expressionist and propaganda films began to rise near to the same time that cinema and film in general began to become a popular pastime for the public. People were still utterly fascinated about the entire cinematic process therefore allowing themselves to become an easy avenue for manipulation through the arts. 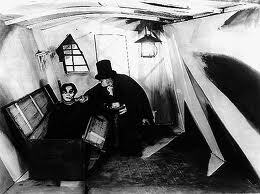 The Cabinet of Dr. Caligari is cited as the first German expressionist film and the beginning of film propaganda. The film was released in 1919, shortly after the end of WWI, at a time when the German population was at a crossroads. Although the war had ended people were still at odds with which ‘side’ they were on and who they could believe and trust, particularly in the case of German authorities. The script of Dr. Caligari was written as a means of protest against the German leaders who had brought despair to the country, with the lead characters of the film, Dr. Caligari and Cesare, taking on the personas of the manipulative German leaders (Dr. Caligari) and the ‘sleepwalkiing’ German citizens (Cesare) who have been recruited to commit crimes for their leader. Upon discovering the intended message of Dr. Caligari, a slightly alternative ending was forced upon the film in which Francis (discoverer of Caligari’s intentions) becomes the paranoid lunatic and Caligari the trustworthy health official. However, the insistence of this ending instead only further enhanced the message that German authorities cannot be trusted. Overall, the film has been analysed as an intended warning to the masses against governmental brainwashing, although upon its release in the US there was a slightly different viewpoint to its intended meaning. While notable American critics hailed it for its new approach to filmmaking, several newspapers argued that the film encouraged the public to reserve their support for American films. Dr. Caligari has also been cited as being the forbearer of Nazi propaganda films. Theorist Siegfried Kracauer argues that the film significantly contributed to the rise of Nazism through distraction from the true political realm with an artistic fantasy world. Considering the main storyline of this film deals with a carnival doctor who uses his assistant to commit murders, it is not hard to see how this classification was made. It is probably not possible that The Cabinet of Dr. Caligari was solely accountable for the rise of Nazism or indeed that the vast majority of the German populace even took head to the message presented in the film. However, it is clear that Dr. Caligari should not only be remembered as being the first German expressionist film, but also as the prototype for political propaganda films worldwide.